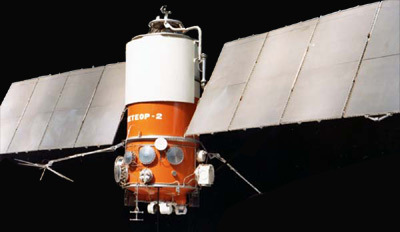 The Meteor-2 series was the second generation of soviet meteorological satellites. They were based on the Meteor-1 series. The instrument complement consisted of three television-type (frame technique) VIS and IR scanners, a five-channel scanning radiometer and a radiometer (RMK-2) for measuring radiation flux densities in the near-Earth space. Meteor-2 21 carried additionally to its regular payload an unique Fizeau Retro Reflector Array (RRA) for Satellite Laser Ranging applications. The Meteor-2 series was replaced by the Meteor-3 series.